Healthcare giant Johnson & Johnson (J&J) has been battling thousands of lawsuits filed by women across the country that developed ovarian cancer due to using the company’s baby powder products. 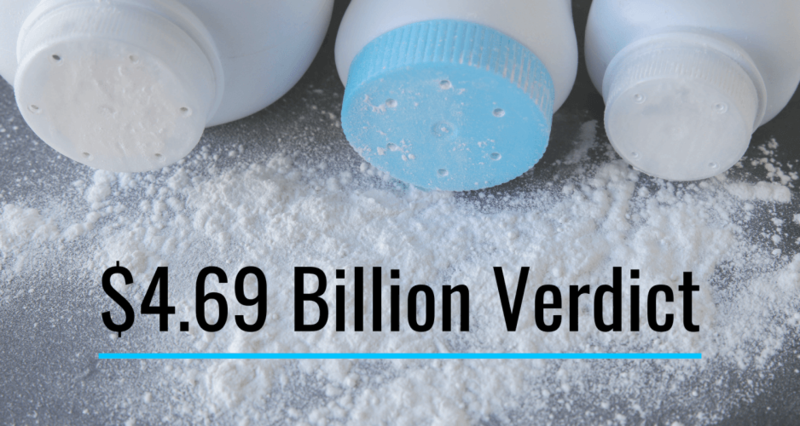 The company was dealt a monumental blow this week when 22 plaintiffs’ successfully obtained the largest baby powder verdict to date. Jurors in Missouri determined J&J hid the cancer risks of baby powder from consumers and awarded the 22 women $4.69 billion in damages. After a six-week trial in St. Louis Circuit Court, jurors deliberated for less than a full day before awarding the women $550 million in compensatory damages and a whopping $4.14 billion in punitive damages meant to punish the company for wrongdoing. For years, the company has marketed baby powder for use in feminine hygiene, but there is no reason women need to use baby powder to stay “fresh.” Unfortunately, in addition to being unnecessary, baby powder is also dangerous. J&J’s baby powder uses talc, which has been shown to cause ovarian cancer. Women who have used J&J’s baby powder for feminine hygiene were never warned of the ovarian cancer risk associated with the product, despite the company’s full knowledge of the risks. For decades, J&J has used a mineral called talc in its baby powder products. Talc, or talcum powder as it is sometimes called, has the ability to absorb moisture, which helps keep skin dry and decreases friction. Because of its natural moisture absorbing properties, talc has been used as the main ingredient in baby powder, accounting for 99.8% of its ingredients. In 1971, British researchers discovered talc particles deeply embedded in a woman’s ovarian tumors. The woman had used J&J’s baby powder for feminine hygiene for decades. Since this initial discovery, over 20 additional epidemiological studies have confirmed a scientific link between the talc in baby powder and the development of ovarian cancer. The mounting scientific evidence was enough to convince the company to hire an independent consultant in the early 1990s to investigate the link between talc and cancer. The independent consultant recommended the company stop defending the safety of talc amid mounting clinical evidence, and instead use a talc alternative like cornstarch. In response to this recommendation, in an internal document entitled “Major Opportunities and Major Obstacles,” the company acknowledged the growing distrust of talcum powder and suggested targeting African Americans and Hispanics with advertising campaigns because these groups have a high prevalence of use. The document states “the brand can increase volume in 1993 by targeting these groups.” The document goes on to list negative publicity from the health community on talc (inhalation, dust, negative doctor endorsement, cancer linkage)…” as one of the company’s largest obstacles. Thursday’s verdict is not the first win for the plaintiffs in the many cases alleging a link between J&J talc, asbestos, and cancer, but it is by far the largest one, and the roughly $213 million awarded per plaintiff would rank with the largest talc verdicts handed down, including a $417 million verdict in California, a $117 million verdict against J&J and its talc supplier in New Jersey, and a $110 million verdict in St. Louis. Tragically, safe talc alternatives have existed for decades. The company could have changed its formula to protect consumers, but ultimately decided not to. Women who used J&J’s baby powder products and developed ovarian cancer deserve to hold the company responsible. If you or someone you love used a baby powder product for feminine hygiene and developed cancer, you have legal options. Consumer Advocacy News can help you understand your rights. Contact us today for more information.